Take a drive through Florida exploring our unique aquaculture and seafood industry without ever even leaving the classroom. Once a year Florida Agriculture in the Classroom hosts an all day event entitled Ag Literacy Day. A representative of Florida Agriculture can register with an elementary school and read to as many classrooms as he or she wants. This years selected date will be May 2, however if you can not attend that specific day, feel free to read the book any time after this day. For the past three years, a friendly old truck has taken us all across the state of Florida to different agricultural operations. The first year he took us to different livestock and poultry farms, last year we stopped by vegetable farms and learned our produce isn’t grown at the grocery store! This year we will see where our favorite lobster tails come from in Drive Through Florida: Aquaculture and Seafood. The Florida aquaculture industry has become very popular in recent years; did you know in 2014 Florida was ranked seventh among all U.S. States for fresh seafood production? 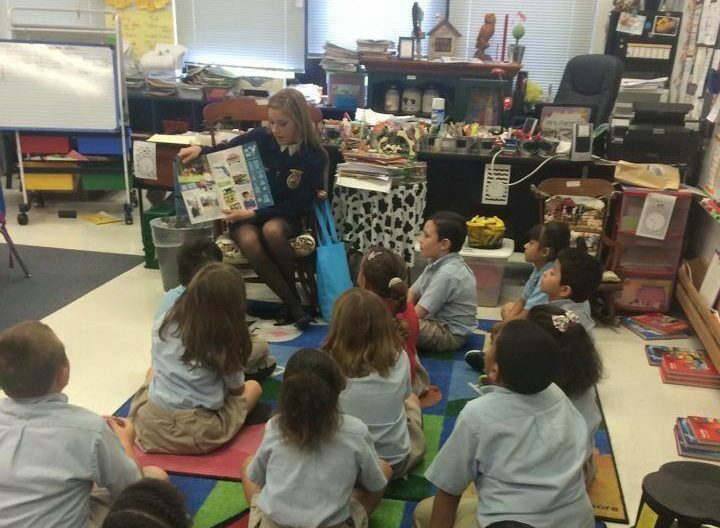 Ag Literacy Day serves as an awesome educational experience, for both the reader and the students. You don’t have to be an expert in aquaculture to read to the classrooms so this gives you an opportunity to further your knowledge and odds are the students are in the same boat as you. Maybe even the teacher as well! All together, everyone learns something new at the end of the day. Can you read on Ag Literacy Day? You may be wondering, “Who can read on Ag Literacy Day?” and “How can I read Drive Through Florida: Aquaculture and Seafood”. Well, do you eat food everyday? Do you have clothes on your back? Do you appreciate all the work US Farmers put in each day to provide for us all? This is your chance to give back to them! Take the day off to help educate consumers on the seafood industry. Registration for the event is super easy. Click here and scroll down to “Ag Literacy Day Registration”. Here you can select if you will be registering a reader, a group of readers, or if you would like to request a reader. Below registration are different activities that teachers can use or that the reader can bring with them such as word searches and coloring pages. We at Central Florida Ag News would like to encourage everyone to register as a representative of Florida Agriculture, get a packet of books, and head down to your local elementary school and educate our upcoming generation on seafood and aquaculture!